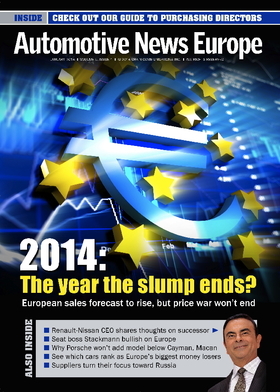 The latest issue of the Automotive News Europe monthly e-magazine is ready for you to view. We enter the new year with good news. Europe’s battered car market is set to grow in 2014 after a six-year slump. The sales rise should ease the price pressure that has saddled some of the region’s carmakers with losses that will weaken them for years. Automakers and industry watchers expect European vehicle sales to increase by up to 3 percent next year. We look at which brands are poised to benefit most from the slight upturn in our cover story. Money-losing Spanish brand Seat will miss its target of making a profit in 2013, but Seat President Juergen Stackmann sees positive signs in Europe. He explains why he’s so bullish. Porsche sales and marketing boss Bernhard Maier told us how the VW Group subsidiary will remain the world’s most profitable automaker. Ford of Europe is on track to turn a profit again by 2015 after years of heavy losses. A key to the turnaround is the automaker’s fast-growing lineup of SUVs. Ford of Europe sales boss Roeland de Waard tells us why. Carlos Ghosn expects it will take two people to fill his shoes when he leaves his position as CEO of both Renault and Nissan. Find out why he feels that way. BMW and Audi parent Volkswagen Group have tech centers in California’s Silicon Valley. Mercedes-Benz followed them in November and Jaguar Land Rover soon will open a technology center in Portland, Oregon, often referred to as the Silicon Forest. Learn what is attracting European premium automakers to the U.S. west coast. Automakers from Fiat to Volkswagen and Daimler to Renault lost a combined 20 billion euros developing and selling models ranked in a top 10 list of the European auto industry’s most “catastrophic” failures of the past 15 years. We provide details on each of the flops. Our Latest Launches section takes a close look at Audi’s sporty S3 compact sedan; Peugeot’s crucial 308 “bread-and-butter” compact line; and the Range Rover’s diesel hybrid SUV. Our supplier section looks at what’s being done to improve Russia’s “weak” auto-parts industry. We have learned that Russia’s lack of high-tech global Tier 1 suppliers is set to decrease as Visteon and Robert Bosch boost their presence in the market. Meanwhile, partmakers such as GKN Driveline, TRW Automotive and Getrag are considering setting up operations there, too. Find out what’s drawing them to Russia. Find out which suppliers have crucial parts in the new Jaguar F-Type. Our rich data section includes sales by brand and model in Europe, Turkey, Russia and the United States; plus the top 25 ranking countries and brands on a global basis. Looking for another sign that the worst could be over in Europe? Vehicle production in November grew by a little more than 1 percent to 1.45 million units.